The United Daughters of the Confederacy (UDC) is an American hereditary association of Southern women established in 1894 in Nashville, Tennessee. The stated purposes of the organization includes the commemoration of Confederate soldiers and the funding of the erection of memorials to these men. Many historians have described the organization's treatment of the Confederacy, along with its promotion of the Lost Cause movement, as advocacy for white supremacy. Headquarters Building of the United Daughters of the Confederacy in Richmond, Virginia, U.S. The group was founded on September 10, 1894, by Caroline Meriwether Goodlett and Anna Davenport Raines as "the National Association of the Daughters of the Confederacy". The first chapter was formed in Nashville. The name was soon changed to "United Daughters of the Confederacy". Their stated intention was to "tell of the glorious fight against the greatest odds a nation ever faced, that their hallowed memory should never die." Their primary activity was to support the construction of Confederate memorials. The UDC also holds that members support U.S. troops and honor veterans of all U.S. wars. In 1896, the organization established the Children of the Confederacy to impart similar values to younger generations through a mythical depiction of the Civil War and Confederacy. According to historian Kristina DuRocher, "Like the KKK's children's groups, the UDC utilized the Children of the Confederacy to impart to the rising generations their own white-supremacist vision of the future." The UDC denies assertions that it promotes white supremacy. The communications studies scholar W. Stuart Towns notes UDC's role "in demanding textbooks for public schools that told the story of the war and the Confederacy from a definite southern point of view". He adds that their work is one of the "essential elements [of] perpetuating Confederate mythology". The UDC was incorporated on July 18, 1919. Its headquarters is located in the Memorial Building to the Women of the Confederacy, Richmond, Virginia. Across the Southern United States, associations were founded after the Civil War, chiefly by women, to organize burials of Confederate soldiers, establish and care for permanent cemeteries, organize commemorative ceremonies, and sponsor impressive monuments as a permanent way of remembering the Confederate cause and tradition. The organization was "strikingly successful at raising money to build monuments, lobbying legislatures and Congress for the reburial of Confederate dead, and working to shape the content of history textbooks". They also raised money to care for the widows and children of the Confederate dead. Most of these memorial associations gradually merged into the United Daughters of the Confederacy, which grew from 17,000 total members in 1900 to nearly 100,000 by World War I. The UDC was influential primarily in the early twentieth century across the South, where its main role was to preserve and uphold the memory of the Confederate veterans, especially those husbands, sons, fathers and brothers who died in the Civil War. Memory and memorials became the central focus of the organization. UDC leaders were determined to assert women's cultural authority over virtually every representation of the region's past. This they did by lobbying for state archives and museums, national historic sites, and historic highways; compiling genealogies; interviewing former soldiers; writing history textbooks; and erecting monuments, which now moved triumphantly from cemeteries into town centers. More than half a century before women's history and public history emerged as fields of inquiry and action, the UDC, with other women's associations, strove to etch women's accomplishments into the historical record and to take history to the people, from the nursery and the fireside to the schoolhouse and the public square. "The number of women's clubs devoted to filiopietism and history was staggering", says historian W. Fitzhugh Brundage, noting that women were much more likely to be involved in a variety of (historical) organizations than men, who devoted their energies to fraternal societies. Brundage notes that after women's suffrage came in 1920, the historical role of the women's organizations eroded. After 1900 the UDC became an umbrella organization coordinating local memorial groups. The UDC women specialized in sponsoring local memorials. After 1945, they were active in placing historical markers along Southern highways. The UDC has also been active in national causes during wartime. According to the organization, during World War I, it funded 70 hospital beds at the American Military Hospital on the Western front and contributed over US$82,000 for French and Belgian war orphans. The homefront campaign raised $24 million for war bonds and savings stamps. Members also donated $800,000 to the Red Cross. During World War II, they gave financial aid to student nurses. 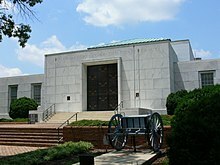 The UDC donated $50,000 for the construction of a Confederate memorial hall on the campus of Vanderbilt University in 1935. By August 2016, the university returned $1.2 million to the UDC after the board of trust, backed by anonymous donors, agreed to remove the word "Confederate" from the building. The UDC encouraged women to publish their experiences in the war, beginning with biographies of major southern figures, such as Varina Davis's of her husband Jefferson Davis, President of the Confederacy. Later, women began adding more of their own experiences to the "public discourse about the war", in the form of memoirs, such as those published in the early 1900s by Sara Pryor, Virginia Clopton, Louise Wright and others. They also recommended structures for the memoirs. By the turn of the twentieth century, a dozen memoirs by southern women were published. These memoirs were part of the growing public memory about the antebellum years and the Lost Cause narrative, which critics have described as white supremacist, as they vigorously defended the Confederacy and its founding principles (which included the enslavement of African-Americans). The Southern Cross of Honor was a commemorative medal created by the United Daughters of the Confederacy for members of the United Confederate Veterans. It was proposed at a meeting in 1898, with 78,761 crosses issued by 1913. It is not authorized to be worn with US military uniforms. During the first decades of their existence, the UDC focused on caring for Confederate soldiers and their widows. When the numbers of Confederate veterans began to dwindle, they focused on their remaining objectives. Education of the descendants of those who served the Confederacy became one of the key interests of the organization. Some state divisions within the UDC built dormitories and sponsored scholarships, but there was no coordinated support for education by the national organization. The divisions were responsible for scholarships and building dormitories for women. At the 1907 General Convention, Caroline Meriwether Goodlett spoke of the shift in the UDC's focus. As monuments were erected, she "sat by ... thinking that the monument fever would abate". She believed that "the most thoughtful and best educated women" in the organization should have realized that the "grandest monument (they) could build in the South would be an educated motherhood". The UDC combined education with support of the military during World War II by establishing a nurses' training fund. Each scholarship provided approximately $100 per year for a three-year nursing program. When a scholarship was offered, local Chapters were encouraged to contact local schools to locate students who needed assistance to fund their education. In addition, the UDC sponsors essay and poetry compositions, in which the participants are not to use the phrase "Civil War", "War Between the States" being the preferred term. The Children of the Confederacy, also known as the CofC, is an auxiliary organization to the UDC. The official name is Children of the Confederacy of the United Daughters of the Confederacy. It comprises children from birth through the time of the Children of the Confederacy Annual General Convention following their 18th birthday. All Children of the Confederacy chapters are sponsored by UDC chapters. Children are taught Lyon Gardiner Tyler's "Catechism on the History of the Confederate States of America, 1861-1865", which says that Northerners did away with slavery because the climate was unsuitable, that they had no intention of ever paying the South for its slaves after abolition, that slaves in the South were faithful to their owners, who were caring and gentle people: cruel slave owners existed only in the North. I think I agree a hundred percent with Ed Sebesta, though, about the motives or the hidden agenda not too deeply hidden I think of such groups as the United Daughters of the Confederacy and the Sons of the Confederate Veterans. They are dedicated to celebrating the Confederacy and rather thinly veiled support for white supremacy. And I think that also is the again not very deeply hidden agenda of the Confederate flag issue in several Southern states. The Southern Poverty Law Center considers the UDC as part of the Neo-Confederate movement that began in the early 1980s, which the Center states is "a reactionary conservative ideology that has made inroads into the Republican Party from the political right, and overlaps with the views of white nationalists and other more radical extremist groups". As of August 2018 their website still stated that ""Slaves, for the most part, were faithful and devoted. Most slaves were usually ready and willing to serve their masters." According to lawyer Greg Huffman, writing in Facing South, "[p]erhaps nothing illuminates the UDC's true nature more than its relationship with the Ku Klux Klan. Many commentators have said the UDC simply supported the Klan. That is not true. The UDC during Jim Crow venerated the Klan and elevated it to a nearly mythical status. It dealt in and preserved Klan artifacts and symbology. It even served as a sort of public relations agency for the terrorist group". UDC funded a now-vanished memorial to the Klan near Concord, North Carolina. Virginia Clay-Clopton (1825–1915), a political hostess and activist in Alabama and Washington, DC. Una B. Herrick, American educator, the first Dean of Women at Montana State College. Adele Briscoe Looscan (1848–1935), president of the Texas State Historical Association (1915–1925). Edith D. Pope, second editor of the Confederate Veteran; president of the Nashville No. 1 chapter of the UDC from 1927 to 1930. Panthea Twitty (1912-1977), photographer, ceramist, and historian. ^ a b c d Mills & Simpson 2003. ^ a b Elder, Angela Esco (2010). "United Daughters of the Confederacy". New Georgia Encyclopedia. Athens: University of Georgia Press. ^ a b Murrin et al. 2014, p. 425. ^ Lampen, Claire (August 17, 2017). "White women helped build the Confederate statues sparking conflict across the South". Mic (media company). Retrieved September 16, 2018. ^ Cox, Karen L. (August 16, 2017). "Analysis | The whole point of Confederate monuments is to celebrate white supremacy". Washington Post. Archived from the original on August 20, 2017. Retrieved September 16, 2018. ^ a b Huffman, Greg (June 8, 2018). "The group behind Confederate monuments also built a memorial to the Klan". Facing South. ^ Simpson 2003, pp. 75–76. ^ Muller, Matthew G.; McLellan, Corey W.; Irons, Charles F. (1996). "Shades of Gray: United Daughters of the Confederacy". Charlottesville: University of Virginia. Retrieved August 22, 2018. ^ DuRocher 2011, p. 88-89. ^ Kutner, Max (August 25, 2017). "As Confederate Statues Fall, The Group Behind Most of Them Stays Quiet". Newsweek. Retrieved September 16, 2018. ^ Towns 2012, p. xi. ^ a b UDC Handbook (6th ed.). Richmond, Virginia: United Daughters of the Confederacy. March 2013. pp. 3–5. ^ Minutes of the One Hundred and Twenty-first Annual General Convention of the United Daughters of the Confederacy, Incorporated, Held in Richmond, Virginia, November 6-10, 2014. p. 12. ^ Faust 2008, p. 237–247. ^ Blight 2001, p. 272–273. ^ Megan B. Boccardi, "Remembering in Black and White: Missouri Women's Memorial Work, 1860-1910" (PhD. Dissertation, University of Missouri-Columbia, 2011, online Archived July 15, 2015, at the Wayback Machine. ^ Hall, Jacquelyn Dowd (1998). "'You must remember this': Autobiography as social critique". Journal of American History. 85 (2): 439–465. doi:10.2307/2567747. JSTOR 2567747. ^ a b Tamburin, Adam (August 15, 2016). "Vanderbilt to remove 'Confederate' from building name". The Tennessean. Retrieved August 15, 2016. Anonymous donors recently gave the university the $1.2 million needed for that purpose; the Vanderbilt Board of Trust authorized the move this summer. ^ a b Koren, Marina (August 15, 2016). "The College Dorm and the Confederacy". The Atlantic. Retrieved August 15, 2016. Vanderbilt will return $1.2 million to the Tennessee chapter of the United Daughters of the Confederacy, the present value of the $50,000 the group donated to the school in 1933 for the construction of the dorm. ... The $1.2 million payment will come from anonymous donors who gave specifically for the removal of the inscription, the school said. ^ Blight 2001, p. 259. ^ Gardner 2006, p. 128–130. ^ Butler, Douglas J. (2013). North Carolina Civil War Monuments: An Illustrated History. McFarland. p. 93. ISBN 9781476603377. ^ Knight, Lucien (2006). Georgia's Landmarks, Memorials, and Legends: Volume 1, Part 1. Pelican Publishing. pp. 222–223. ISBN 9781455604814. ^ Tucker, Spencer C. (September 30, 2013). American Civil War: The Definitive Encyclopedia and Document Collection [6 volumes]: The Definitive Encyclopedia and Document Collection. ABC-CLIO. p. 2202. ISBN 978-1-85109-682-4. ^ Cox 2003, p. 73-74. ^ Cox 2003, p. 90. ^ "News". The American Journal of Nursing. 42 (7): 825. July 1942. ^ a b Woodruff, Juliette (1985). "The Last of the Southern Belles". Studies in Popular Culture. 8 (1): 63–70. JSTOR 23412915. ^ The History of the United Daughters of the Confederacy. Volume I and II: 1894–1955. Raleigh, N.C.: United Daughters of the Confederacy. 1956. pp. 181–189. LCCN 94135238. OCLC 1386401 – via Edwards & Broughton Company. ^ Janney 2012, p. 12–13, 139. ^ Johnson, Joan Marie (2000). "'Drill into us... the Rebel Tradition': The Contest over Southern Identity in Black and White Women's Clubs, South Carolina, 1898–1930". The Journal of Southern History. 66 (3): 525–562. doi:10.2307/2587867. JSTOR 2587867. ^ Angela Esco Elder, "United Daughters of the Confederacy" in New Georgia Encyclopedia (Georgia Humanities Council/University of Georgia Press: original entry July 23, 2010; last updated October 12, 2016). ^ Goodman, Amy (November 3, 1999). "Democracy Now – interview with James McPherson, Ed Sebesta". Pacifica Radio Network. ^ "THE NEO-CONFEDERATES". Southern Poverty Law Center. Retrieved May 20, 2017. ^ Hague, Euan (January 25, 2010). "The Neo-confederate Movement". Southern Poverty Law Center. Retrieved August 23, 2018. ^ Hill, Allen G. Breed of the Associated Press in Chapel; Carolina, North (August 10, 2018). "'The lost cause': the women's group fighting for Confederate monuments". the Guardian. Associated Press. ^ "Greg Huffman". Facing South. August 25, 2017. Retrieved December 13, 2018. ^ Smith, Blanche Lucas (1941). North Carolina's Confederate Monuments and Memorials. North Carolina Division, United Daughters of the Confederacy. p. 35. ^ Binheim, Max; Elvin, Charles A (1928). Women of the West; a series of biographical sketches of living eminent women in the eleven western states of the United States of America. Retrieved August 8, 2017. ^ McLemore, Laura Lyons (2016). Adele Briscoe Looscan: Daughter of the Republic. Fort Worth: TCU Press. ^ Simpson, John A. "Edith Drake Pope". The Tennessee Encyclopedia of History and Culture. Tennessee Historical Society and the University of Tennessee Press. Retrieved September 24, 2017. ^ "Twitty, Panthea Massenburg – NCpedia". Retrieved December 3, 2018. Blight, David (2001). Race and Reunion: The Civil War in American Memory. Cambridge, Massachusetts: Harvard University Press. Cox, Karen L. (2003). Dixie's Daughters: The United Daughters of the Confederacy and the Preservation of Confederate Culture. University Press of Florida. DuRocher, Kristina (2011). Raising racists : the socialization of white children in the Jim Crow South. University Press of Kentucky. ISBN 978-0813130019. Faust, Drew (2008). This Republic of Suffering: Death and the American Civil War. New York: Alfred A. Knopf. Gardner, Sarah (2006). Blood And Irony: Southern White Women's Narratives of the Civil War, 1861–1937. Chapel Hill, North Carolina: University of North Carolina Press. Gulley, H. E. (1993). "Women and the Lost Cause: Preserving A Confederate Identity in the American Deep South". Journal of Historical Geography. 19 (2): 125–141. doi:10.1006/jhge.1993.1009. Janney, Caroline E. (2012). Burying the dead but not the past : Ladies' Memorial Associations and the lost cause. University of North Carolina Press. ISBN 978-0807831762. Murrin, John M.; Johnson, Paul E.; McPherson, James M.; Fahs, Alice; Gerstle, Gary (2014). Liberty, Equality, Power: A History of the American People. concise 6th ed. : Cengage Learning. p. 425. ISBN 978-1-285-54597-4. They refused to let go of the legacy of the defeated plantation South. They celebrated the Lost Cause by organizing fraternal and sororal organizations such as the United Daughters of the Confederacy (UDC), whose members decorated the graves of Confederate soldiers, funded public statutes of Confederate heroes, and preserved a romanticized vision of the slavery era. Simpson, John A. (2003). Edith D. Pope and Her Nashville Friends: Guardians of the Lost Cause in the Confederate Veteran. Knoxville, Tennessee: University of Tennessee Press. ISBN 978-1-57233-211-9. OCLC 428118511. Mills, Cynthia; Simpson, Pamela Hemenway, eds. (2003). Monuments to the Lost Cause: Women, Art, and the Landscapes of Southern Memory. Univ. of Tennessee Press. ISBN 978-1-57233-272-0. Minutes of the Fifty-first Annual Convention of the United Daughters of the Confederacy, Incorporated, Held at Nashville, Tennessee, November 21-24, 1944. Rutherford, Mildred Lewis (1916). What the South May Claim. Athens, Georgia: M'Gregor Co.
Poppenheim, Mary B. (1956). The History of the United daughters of the Confederacy. Raleigh, North Carolina: Edwards & Broughton Co. OCLC 1572673. The History of the United Daughters of the Confederacy. Volume III: 1956–1986. Raleigh, N.C.: United Daughters of the Confederacy. 1988 – via Edwards & Broughton Company. Foster, Gaines M. (1987). Ghosts of the Confederacy: Defeat, the Lost Cause, and the Emergence of the New South. New York: Oxford University Press. Parrott, Angie (1991). "'Love Makes Memory Eternal': The United Daughters of the Confederacy in Richmond, Virginia, 1897–1920," in Edward Ayers and John C. Willis, eds. The Edge of the South: Life in Nineteenth-Century Virginia, Charlottesville: University Press of Virginia. Codieck, Barrett. "Keepers of history, shapers of memory: The Florida division of the United Daughters of the Confederacy, 1895-1930". MA Thesis, Florida State University, 2012. Huffman, Greg (June 8, 2018). "The group behind Confederate monuments also built a memorial to the Klan". Facing South. Breed, Allen G. (August 10, 2018). "'The lost cause': the women's group fighting for Confederate monuments". The Guardian. Holloway, Kari (October 5, 2018). "7 things the United Daughters of the Confederacy might not want you to know about them". Salon. Holloway, Kali (November 2, 2018). "Time to Expose the Women Still Celebrating the Confederacy". Daily Beast. Their name is on all their monuments, but maybe because those plaques are rusty and faded people don't realize the UDC is still a functioning organization.